My sister bought a Hyacinth. It was in a glass bulb shaped vase. With the roots in water, it had lots of blooms. But it died. I said I'd take it. What's the best way to save the flower? The bulb looks fine, just the blooms died. 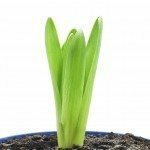 This article will help with care after the flowers have faded.